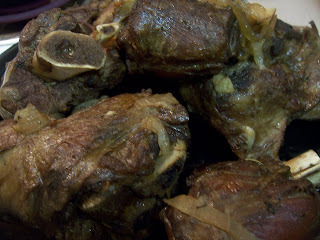 Only two stores I shop at, AJ's and Sprouts, regularly carry lamb shanks, but every time I see them, I am curious and tempted to buy them...but not sure what I'll do with them or when I'll make them. But this week was the week. I bought about 3 lbs (bone-in) and off they went home with me. I frankly have never cooked any sort of "shank" but know they call for a long slow braising and some sort of succulent sauce should form. I recalled Clotilde's recipe on her blog Chocolate and Zucchini, for braised veal shank in a sweet white wine, and remembered a great short rib recipe I made, and came up with this hybrid. Use good red wine - it matters! I used an old vine Zinfandel with great results. Serve over egg noodles, rice or potatoes, and make extra. This is really, really good. Salt and pepper shanks. Sear over high heat in olive oil until browned on all sides. Remove from pan. Add onions and garlic to pan, saute until beginning to soften and brown slightly. Pour in wine to deglaze pan, bring back to a simmer and add beef broth. Bring back to a simmer and add back shanks. 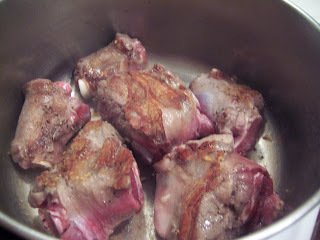 Nestle the shanks into the liquid, tuck the herb sprigs down among meat and broth. Cover and cook at 250 for 3-4 hours or until the lamb is practically falling off the bone. 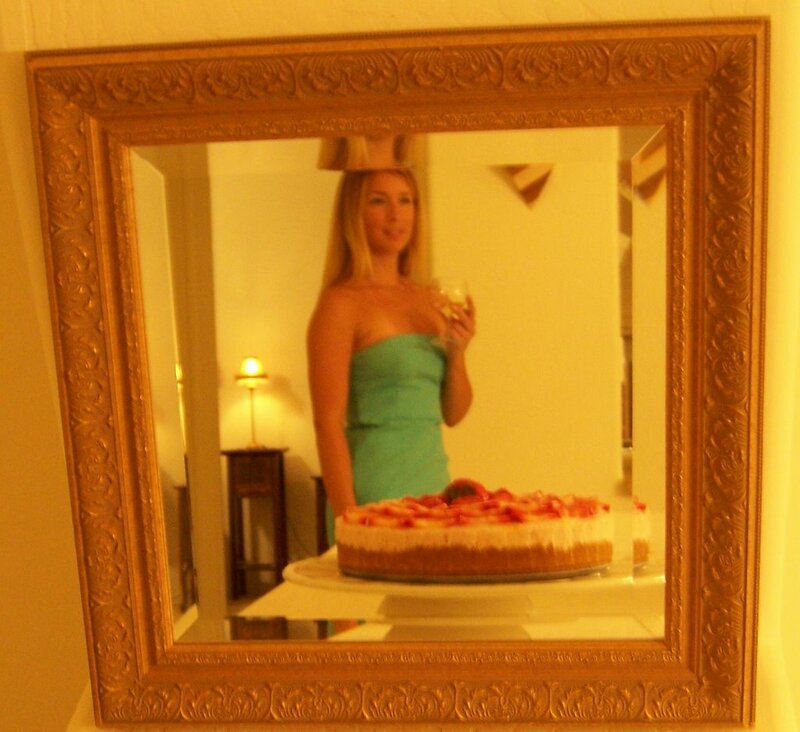 If serving immediately, remove shanks to a plate. Next, strain remaining liquid to remove solids, then boil remaining sauce over high heat until a thickened sauce is formed. Drizzle over lamb before serving. If serving the next day (recommended), keep everything in the same pot and let cool and cover and chill. Once cold (the next day), skim layer of fat off the top of the pan. Reheat slowly over medium heat or in a 350 oven. 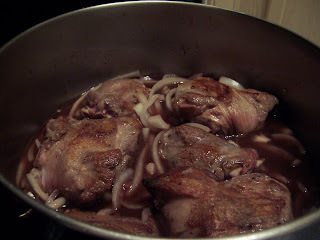 Remove shanks once warmed through, strain sauce and reduce into a sauce not unlike a demi glace. 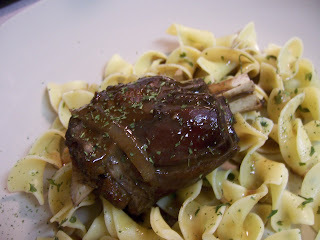 Kirsten, the lamb is so nicely browned - it looks delicious! I love using rosemary but haven't used thyme much - time to try something new! 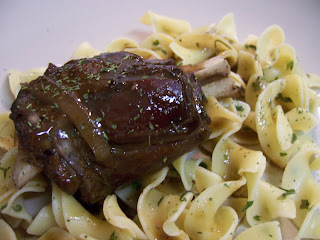 Anytime I see lamb shanks on a restaurant menu, I suddenly go blind to the rest of the menu. This sounds wonderful, Kirsten, but I can't imagine being patient enough to wait a day to attack it. drool. slobbery drool. That's all I can say. This looks wonderful. I am always looking for new ways to cook lamb. Thanks! Hey Terry B - I know, overnight is hard, esp when they are done @ about 11 p.m. just as I was going to bed...they were worth it though...I'll be making these a lot more. Hi Chris - I too adore lamb and new (not too expensive) ways are good to have. You are MOST welcome.